Moving Out Of State 101 | Car Couriers Inc.
Moving out of state requires a lot more planning and work then just moving neighborhoods in the same city. In fact, the process can be downright overwhelming. It’s easiest to get started by making a packing and moving plan. Ideally, the entire household should sit down together and come up with a to-do list. This list should include tasks like packing up certain rooms, cancelling service from current providers and deep cleaning after a room has been completely packed. Each task should have a due date and be assigned to specific people. They should be ordered in a way that makes sense but that isn’t stressful or unattainable. When you have a plan in place, start early. It’s easy to keep thinking you have a lot of time, but the weeks fly by when you’re arranging a big move. Before you know it, it’s time to move and you have nothing packed or ready to go. Starting the packing process early also prevents last minute problems from popping up like not having enough boxes or not being able to arrange a moving company. 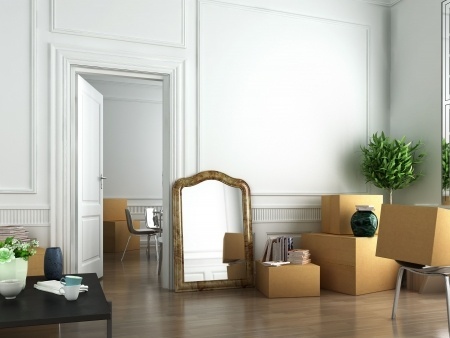 As you sort through your things and start to pack, you will come upon fragile or important items that you don’t think should be placed in a box among all your other belongings. These pieces should be transported with you in your vehicle. Expensive or large items should be moved through a professional moving company. Exotic or classic cars for example can be transported instead of driven from your old home to new keeping their mileage and great condition the same. Durable or less important items should still be packed carefully and efficiently. Empty space inside of boxes is wasted room. When packing, but the heaviest items on the bottom of the box so they don’t damage smaller items throughout the move. Clothes can be moved on hanging, rolling racks so you don’t have to spend time taking them off the hangers and then putting them back on. Moving from one state to another can be stressful, but it doesn’t have to be. Planning ahead and getting help from professionals can make your transition a lot more organized and simple. The more prepared you are for your out-of-state move, the easier it will be to unpack when you arrive. Getting your new home set up quickly means that you can spend less time moving and more time starting your new life!